"MMANA-GAL basic is free for Amateur Radio Use"
"Official" MMANA-GAL & MMANA-GAL PRO English support group! 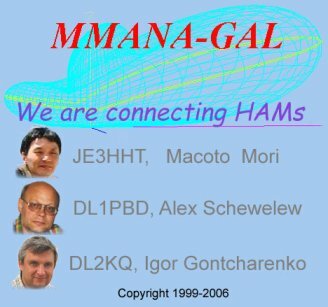 MMANA-GAL is an antenna-analyzing tool based on the moment method, which was introduced in MININEC. The program provides ability for changing the language of signs and messages of the program. In addition to English (default), Russian (more information about Russian MMANA available on DL2KQ's website: http:\\www.dl2kq.de) and Bulgarian, five more languages have been added with the new release. You now have the additional choice of German (by Alex Schewelew, DL1PBD and Ulrich Weiss, DJ2YA), [more information about German MMANA-GAL available on website: http://dl2kq.de/mmana/4-7.htm], Japanese (by Nobuyuki Oba, JA7UDE), Spanish (by Valentin Alonso Gracia, EA4GG & Dimitri Aguero, F4DYT), Serbian (by Slobodan Ilic' YU1GV), and Czech (by Martin Kratoska, OK1RR) user languages. Users can easily write a file in their own language by editing the English one. This means, MMANA will be able to communicate with an user in ANY language, actually in the language of his operation system, and that users will be able to write language files themselves. Besides, a user is now able to edit the program's signs, messages and Help file in his own language. NEC-2 for MMANA is useful utility for MMANA. It is intended for calculation of *.maa files and for simulation of antenna models using input language NEC-2 and based on MMANA models. - Norton ground model and calculations used with NEC-2 extended thin wire kernel. Also it is possible to calculate in a case where wires are in dielectric isolation. What Happened to the MMAMA Program? MMANA has a new name. and will now be called MMANA-GAL - GAL is an united abbreviation of names of DL1PBD and DL2KQ. This reflects substantial structure changes to the program. Besides regular improvements, new improvements create the possibility of further improvements of capabilities and services available with the program. The PRO version MMANA-GAL is a new powerful Antenna-Analyzing Tool, which was developed around the successful but basic MMANA-GAL engine. To maintain compatibility with existing files much of the original MMANA-Gal functionality has been incorporated into the new software. The PRO version has been specifically developed to handle very complex antenna designs. The Official MMANA-GAL - MMANA-GAL PRO English support group! Please join us in the new Official English Suport Group.